Are you only confined by the walls you build yourself? Question… What do Stephen Hawking, Paralympians and Nelson Mandela all have in common? Answer… They have all made the decision not to be limited by any physical, emotional or psychological restraints. You may think ah yes, but they are special, that’s not me. What if I were to tell you that you have the choice to move beyond your perceived limitations as well, anytime you want? There is the quote “You are confined only by the walls you build yourself” What exactly does this mean? My interpretation of this is that we are in charge of our own lives and that the only limitations we have that hold us back from achieving the life we truly want are self imposed. Hard to take? We are in reality holding ourselves in check with the self talk that we are running daily in our minds. Human beings are the most elaborate and convoluted excuse makers in the business. We find the best justifications for not doing things, for putting the breaks on. It’s interesting to observe our self talk when an opportunity comes up that pushes us, however slightly, out of our comfort zone. The inner dialogue can run like this “Well, of course I can’t do it because…. I have never ever done anything like this…. I’d have to change far too many things…Who will look after the children, cat, tortoise? If all these perceived obstacles were magically cleared away, would you do it? And if not, why not? There is this interesting dichotomy in the human make up, that has us craving security and a desire to cocoon ourselves in our comfort zone, only to find that we are uninspired, frustrated and bored when we are safely ensconced in there. It’s the fear of the unknown that keeps us secured within the limits of what we do know, this is what prevents us from moving forwards in our lives. The reason that we feel unfulfilled and boxed into our comfort zones is because we actually thrive on challenges. You know how you’ve felt in the past when you have overcome a challenge? 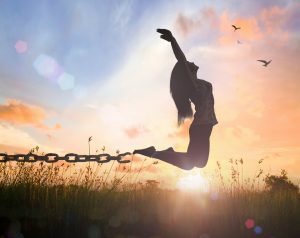 You feel alive, excited and fulfilled, high on life! There is that other famous quote that says “Life begins outside of your comfort zone” and this is so true. Our comfort zone is a dead zone and in order to feel alive we need to step outside of it and challenge ourselves to the best things that our life has to offer. If you have ever spent time with young children you’ll know that they all go through the WHY stage. Everything you say is questioned and you find yourself answering the why’s and actually explaining to yourself and the child why something is so. So the conversation can go something like this… Why did you say sorry to that man? I apologised for bumping into each other. Yes but why did you say sorry when he didn’t? Well that’s just what you do. Why???? Now I believe we need to bring the simple question ‘why’ into our adult lives. Why don’t you go on that trip to Cuba to dance Salsa which you’ve always wanted to do? (one of mine!) Why haven’t you changed jobs as the one you’re currently in is so uninspiring and soul destroying? Why haven’t I reached out to that old friend? Why am I still in a relationship which would benefit both of us if we called it a day? Why? By asking ourselves why, when we are repeating the same old justifications to ourselves as to why we can’t do something, we start to unpick these excuses and they will actually start revealing themselves for what they really are. Limitations and restrictions to keep us safely locked into our comfort zone. Next time you get an inspiration to do something, go somewhere or change your life in a new way listen to your self talk…. And ask yourself why, and most importantly, why not?